Active asset managers faced increasing headwinds in 2018, driven by the appetite for passive investments, the pressure to deliver better performance at a lower cost, and fewer avenues for growth as gatekeepers and consultants shrink the number of managers on their focus lists. But until recently, rising equity markets had kept many firms from feeling the full brunt of these secular forces. That changed in late 2018 as stocks retreated amid Fed tightening and signs of a peak in the economic cycle, leading to record outflows from mutual funds in December. Though markets have since rebounded, most economies are still slowing, fiscal stimulus is declining and profit margins are coming under pressure. With central banks becoming more supportive, the global economy should be able to sustain positive growth. However, we believe markets are headed toward the later phases of the cycle, typically a challenging period characterized by lower returns, higher volatility and a reduced appetite for risk. In the past, such conditions might have been just a normal part of the business cycle for asset management companies to navigate. But with the cumulative effects of organic decay, margin deterioration and poor investment performance tightening their grip, we believe the coming years could present an existential tipping point for some managers. These forces are manifesting in a wave of mergers, layoffs and leadership changes as companies struggle to overhaul their business strategies and redefine their value proposition to investors. However, unless they can address the root cause of the decay— investment underperformance—we suspect any benefits from these efforts are likely to be short lived, consumed by the receding tide of the economy, a lower-return environment and the relentless rationalization of overcapacity. In 2018, 9 of our 10 core strategies outperformed their respective benchmarks in a year when the majority of active managers continued to lag. Based on assets under management (AUM), 93% of our portfolios outperformed on a 1-year basis, and 98% outperformed over both 5 and 10 years. In addition, 83% of our open-end fund assets were rated 4 or 5 stars by Morningstar—a critical threshold for inclusion on distributor platforms. Our performance success has allowed us to grow our relationships with institutional clients and has elevated our profile with wealth management intermediaries, resulting in 7 of our funds being added to 23 recommended lists across 11 distribution partners in 2018. Together, this activity has led to market share gains in virtually every core strategy we manage. To build on this success, we are going deeper in our efforts to deliver sustainable, superior alpha by isolating and systematically mining new sources of return potential across our asset classes. This includes initiatives to complement our fundamental research process with other techniques, such as enhanced data mining and the use of quantitative strategies and portfolio optimization tools. Leadership continuity. 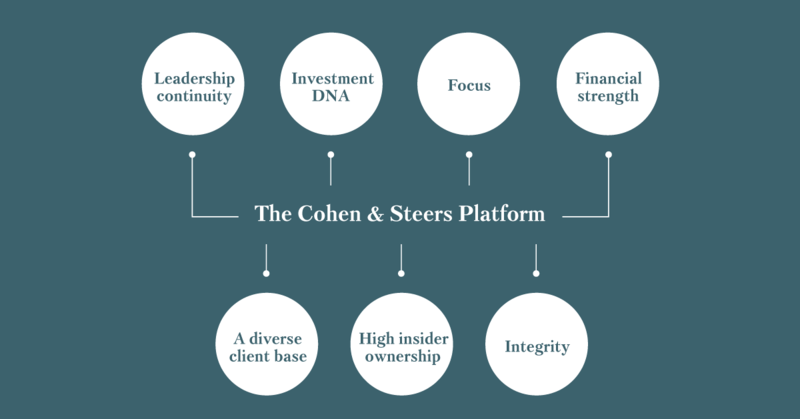 Cohen & Steers has enjoyed exceptional stability in both our management and investment teams, born of a culture of disciplined decision-making, developing talent and promoting from within. Investment DNA. From the very beginning, investment excellence has been our top priority, guiding every strategic decision—from how we allocate resources to which strategies and products we develop for clients. Focus. To create an investment advantage, we concentrate on listed real assets and alternative income, where active managers have historically had greater success in adding value. And as an independent manager, we have no other business interests to distract us from generating alpha. Financial strength. A debt-free, cash-rich balance sheet has allowed us to weather even the most challenging market environments without downsizing, while providing capital to develop new strategies and investment vehicles. A diverse client base. Because demand can ebb and flow across different regions and markets, we reach a wide range of investors through our global distribution network, focusing on markets that appreciate what we do and where allocations to our asset classes are rising. High insider ownership. Cohen & Steers is a publicly traded company in which employees own a large equity stake, promoting retention and aligning individual interests with investment performance and other goals of the firm. Integrity. We put clients first in every aspect of our business, such as enforcing the highest compliance standards, carefully managing the capacity of our strategies, being thoughtful about product development, and advocating on behalf of investors through proxy voting, environmental, social and governance (ESG) initiatives and industry involvement. Institutional allocations to real assets have been rising steadily over the past decade, and while listed strategies have seen inflows, many investors have focused predominantly on the private market. However, faced with rich asset pricing and low expected returns in the private market, more investors are finding the listed market to be a competitive option— particularly with nearly $500 billion of dry powder sitting on the sidelines in private real estate and infrastructure funds. Some of these mandates are coming from institutions that are allocating to listed real assets for the first time. The prospect of slower economic growth and stable interest rates has also renewed interest in several of our strategies from individual investors looking to protect their portfolios with defensive, diversifying strategies that pay attractive dividends. Real estate companies are seeing generally healthy demand from tenants, yet certain sectors and countries currently trade at discounts to their underlying asset values, adding to the appeal of predictable cash flows and high dividend yields in a lower-return environment. Listed infrastructure has historically demonstrated resilience in volatile markets and stands to benefit from significant private-market investment demand for infrastructure assets. Midstream energy offers compelling upside, driven by a recovery in pipeline fundamentals, better corporate governance, stronger balance sheets and a shift to more self-funding business models. Preferred securities are coming off their first year of negative returns in a decade despite strong overall credit fundamentals. Preferreds offer attractive relative values, high tax-advantaged income and a differentiated risk profile relative to high yield and other alternative-income strategies. Multi-strategy solutions allow investors to put it all together in a diversified listed real assets allocation, often through custom portfolios targeting specific return/risk objectives. At a time of structural change for the asset management industry, our clients know what to expect from us, because it’s what we have been doing for 32 years: focusing on delivering performance, sticking to our strengths and offering relevant solutions that address client objectives. The strength of our brand in listed real assets and alternative income has allowed us to forge longstanding relationships with clients—something we expect will become even more important as industry overcapacity is rationalized and investors look to trusted managers for results. For example, some institutional investors are looking for strategic partners to consolidate their various allocations to listed real assets. We are deepening our engagement with these clients, partnering with them to understand their evolving needs and delivering custom multi-strategy solutions that provide efficiencies, risk management and asset-allocation overlays. We are expanding our efforts to address the needs of investors who have shown interest in specialized products and services around our core strategies. In particular, we are developing customized portfolios and vehicles suited to the unique demands of endowments, foundations, multi- family offices and the outsourced chief investment officer (OCIO) market. These investors have historically focused on private equity and hedged strategies; however, we believe there is an opening for highly concentrated, limited-capacity strategies targeting unique, thematic opportunities in listed real assets and alternative income. March 2009 and has outperformed nearly all others since our initial public offering (IPO) in 2004. The stock has consistently received a price-to-earnings multiple above the industry average—a recognition of the strength and depth of our platform and the organic growth we have achieved as a result of our market position and leading investment performance. The downsizing taking place across the industry in response to overcapacity is creating career risk for asset management professionals, including fewer jobs, more- limited career-path options and pressure on compensation. In our 32-year history—including during the financial crisis— Cohen & Steers has not used layoffs as a lever to cut costs, an ability afforded to us by our debt-free balance sheet and employee ownership. In fact, in prior downturns, we have gone on offense by hiring to pursue growth strategies. We believe in developing talent and providing opportunities for advancement based on merit. Compensation is aligned for all employees—and especially for the investment department— with key performance metrics for the firm and for each department and discipline. And we have clear succession plans in place to smooth transitions in the event of departures, while creating career paths for emerging talent. Taken together, these advantages put us in a strong position to recruit and retain top talent. We are excited to place Cohen & Steers in a position to achieve success in these areas, supporting our ultimate goal of generating long-term positive organic growth. If we continue to deliver, that would put us in rare territory in a maturing industry. Despite strong relative performance in nearly all of our core investment strategies, Cohen & Steers was not immune to the volatility in financial markets during the fourth quarter. Net flows were essentially flat through the first three quarters of the year, before a market downturn in the final months sparked retail investor redemptions, resulting in net outflows excluding distributions of $1.2 billion in 2018 and 2% organic AUM decay. Against this challenging backdrop, Cohen & Steers had record revenues of $381 million in 2018, a modest increase from $379 million in 2017. Our operating margin was 38.6% in 2018, compared with 40.9% in 2017. Net income attributable to common stockholders was $2.40 per diluted share ($2.40 as adjusted(1)), compared with $1.96 in 2017 ($2.07 as adjusted(1)). The increase in net income was largely a result of benefits relating to the Tax Cuts and Jobs Act, which contributed to the reduction in our effective tax rate to 23.12% (25.25% as adjusted(1)) in 2018, compared with 42.50% (37.75% as adjusted(1)) for 2017. AUM declined 12% to $54.8 billion at year-end 2018, from $62.1 billion a year ago. Average AUM for the year was $59.0 billion, compared with $60.3 billion for 2017. The decrease in total AUM reflected a combination of net outflows excluding distributions of $1.2 billion, market depreciation of $2.5 billion and distributions of $3.6 billion. Our global and international real estate strategies continued to benefit from increased market share, investor demand for global real estate and favorable relative returns, supported by significant outperformance in our European real estate portfolios. However, net inflows of $306 million were offset by market depreciation of $359 million and distributions of $199 million, resulting in a 2% decrease in global real estate AUM for the year. Our U.S. real estate strategies also outperformed the broad REIT market, but market depreciation of $959 million, together with net outflows of $670 million and distributions of $2.6 billion, resulted in a 16% decline in AUM. For the 15th consecutive year, our flagship preferred securities strategy outperformed its benchmark. However, the preferred securities market experienced its first year of negative returns in a decade, as widening credit spreads offset the positive effect from a decline in Treasury yields. Net outflows of $220 million, market depreciation of $586 million and distributions of $560 million resulted in a 9% decline in preferred securities AUM. Global listed infrastructure outperformed the global equity market in 2018, consistent with its more defensive characteristics. Net inflows of $153 million were countered by market depreciation of $403 million and distributions of $199 million, resulting in a 6% decline in global listed infrastructure AUM. For the tenth consecutive year, we increased our regular quarterly dividend, from $0.28 to $0.33 per share in March 2018. In December, we paid a special dividend of $2.50 per share—our ninth such dividend in nine years, bringing aggregate special dividends since our IPO to $11.00 per share. Subsequent to year end, we increased our quarterly dividend by 9% to $0.36 per share in March 2019. We ended the year with a strong balance sheet, with no debt and $213 million in cash, cash equivalents, U.S. Treasuries and seed investments, compared with $257 million at the end of 2017. Please see the full Annual Report for important disclosures.